Our second trip to Grand Rapids last Saturday was also our second trip to Gerald R. Ford International Airport. We had to drop J’s mom off to fly back to Florida in the morning then go back later in the evening to pick J up from her trip to Las Vegas. J wasn’t supposed to fly in to Grand Rapids. Her flight on Friday which ended in Kalamazoo was cancelled and the quickest way to get home to was to fly to GRR. It made for a long day for the kids and traveling back and forth on 131 but we were all happy to get her home. The flight came in a little after 5:00 and we were just pulling into the parking garage as she landed. We found her at the gate, grabbed her bag, then started heading home. 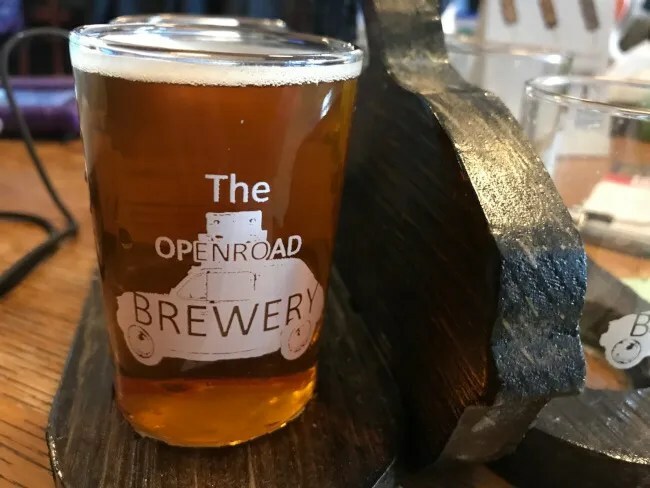 There’s a brewery in Wayland that I have been wanting to get to for quite a while. I have heard good things about it from friends but we don’t go north very often. I finally had my opportunity. 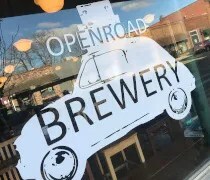 OpenRoad Brewery is in downtown Wayland on Main Street just south of Superior Street. 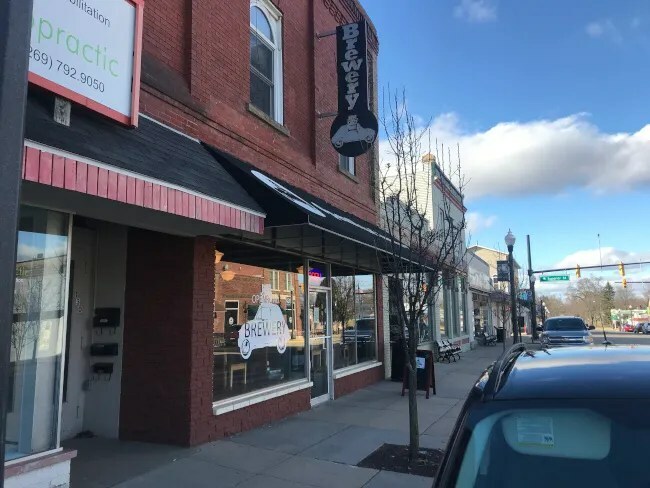 The building is part of a downtown that utilizes street parking and lots behind the buildings We found a spot just around the corner on Pine Street and walked around to the front entrance. 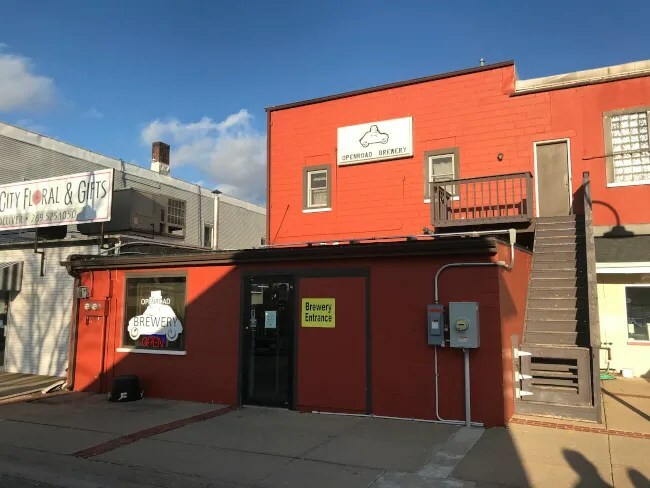 We didn’t realize it at the time but there is also a back entrance off the alley where there are a few parking spots as well. 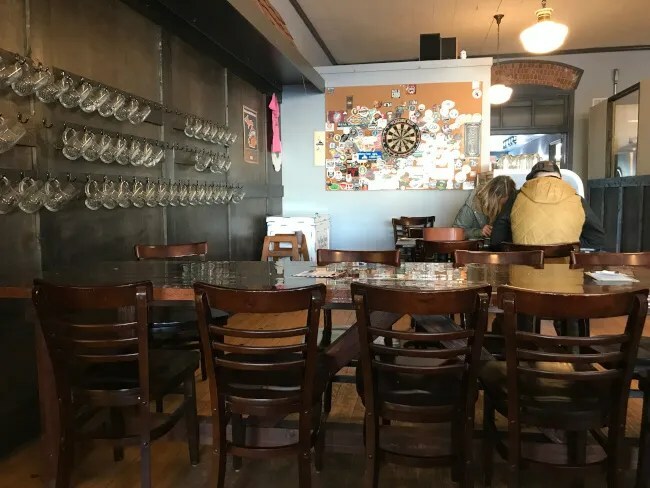 Before it was a brewery, this space was a coffee shop for quite a while. 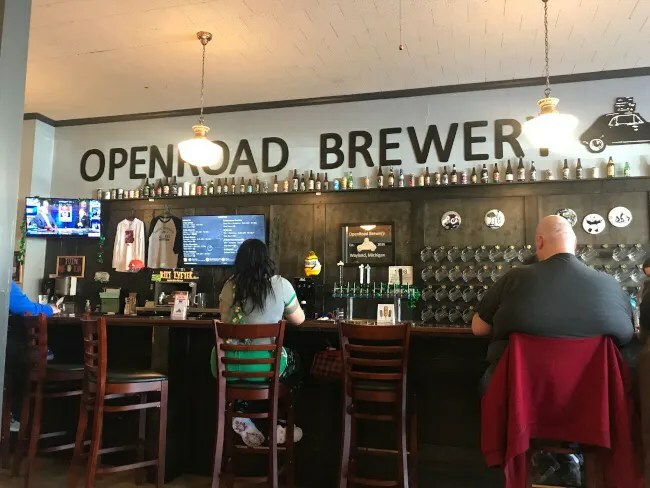 OpenRoad had a lot of changes to make to create this space. The centerpiece is a huge bar along one wall. There are glass mugs hanging from hooks for their mug club members and the beer list is on a TV on one end. The dining room space keeps a lot of the dark woods from the bar in both the furniture and the walls. The space is deceivingly big with a variety of table sizes spread throughout the space. 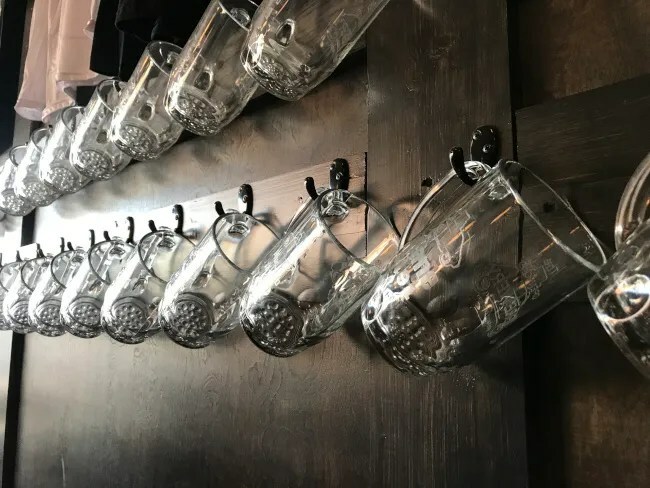 The walls are also covered with the glass mugs for the mug club members. We sat along one wall and I was worried I was going to accidentally bump in to a row of mugs and knock them off. We took a round four top in the middle of the dining room. A waitress saw us sit down and came over with menus right away. 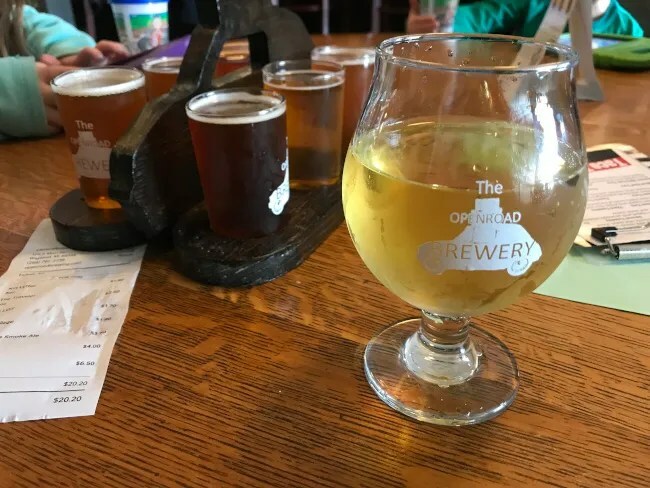 J had a hard time deciding between a mead and a cider. She ended up picking the mead called Mr. Man-go. The drink was really sweet with just a hint of mangoiness. I did a flight. 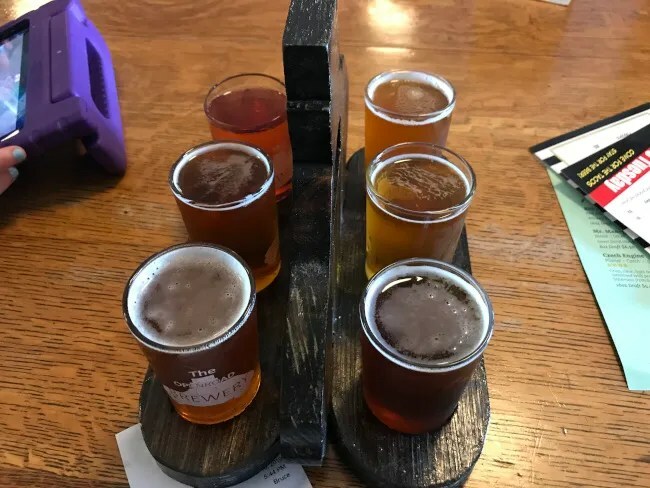 The waitress said I could pick as many as I want but their carrier holds six beers…..so I picked six beers. We apparently were there during their St. Patrick’s Day celebration and they had just tapped an Irish Red Ale called Kilt Lyfter. I’m pretty indifferent to red ales, but I chose it because it was new and it was St. Patrick’s weekend. The beer is solid. It’s not something I would drink a lot of but it was an enjoyable start to this flight. Beer number two of my flight was the Belgian Tripel called The Traveler. Again, a solid beer with a little bit of a candied orange flavor. My third selection was Scizor. This was actually the other drink J was looking at so I got it so she could have a taste too. 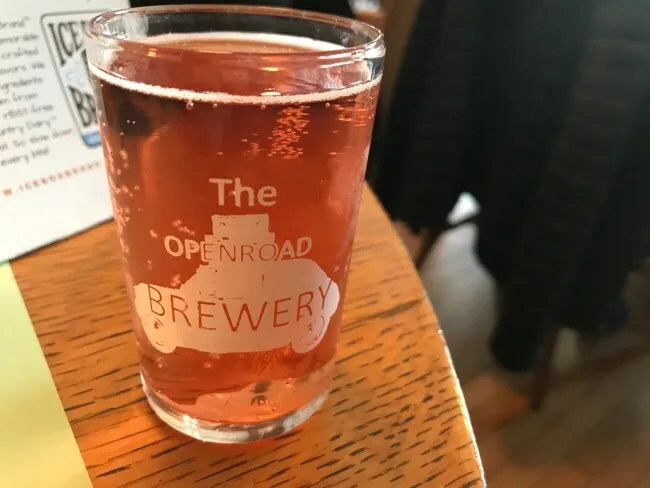 Scizor is a sweet cider that is very sweet….just the way I like them. Winston was my next choice. This is a smoked beer. Just like with meat, smoking a beer gives such a unique, delicious flavor. This is a sipping beer. You can’t down a lot of them quickly but it’s a great flavor that should be enjoyed. Now we’re getting into the IPA’s. I picked up the American IPA first. IPA Lot is dry hopped with Cascade hops. It has a smooth, drinkable flavor. It’s not overly hoppy and can be sipped endlessly. 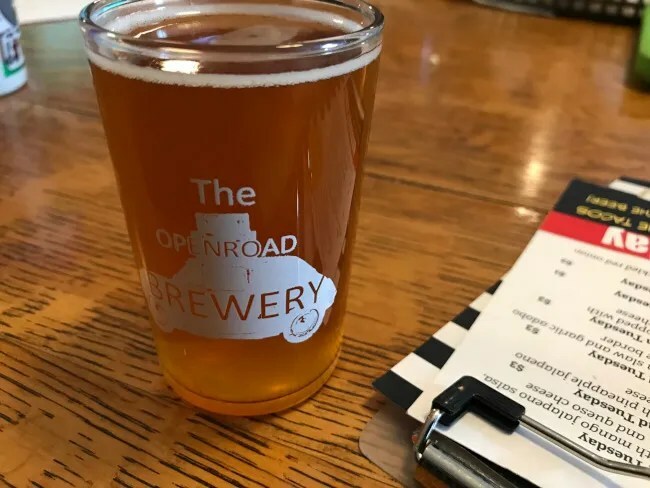 The final beer of the flight was Road Rage Double IPA. This one was very hoppy but not super bitter and a great finish to the meal. Right after we ordered, the waitress came over with a little snack for the kids. She grabbed a basket of popcorn which didn’t last long on our table. She noticed that and brought over a second basket before we got the first one finished. 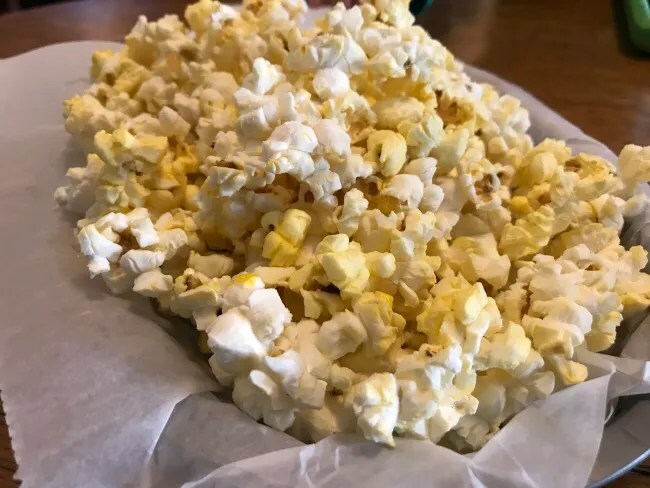 The kids needed that little snack to hold them over…and who doesn’t like popcorn at a bar? 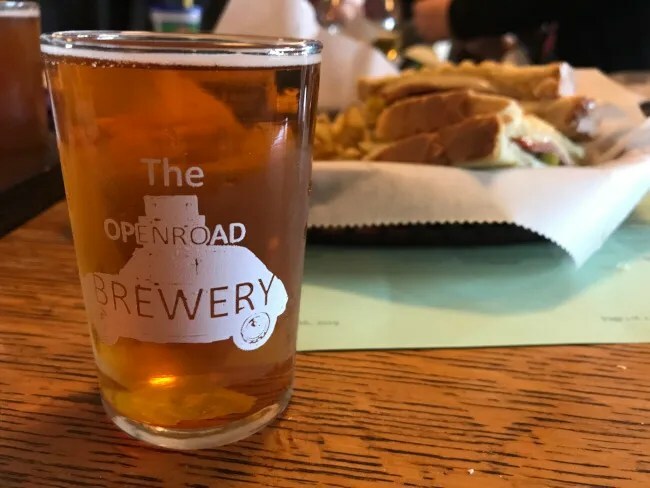 The food menu at OpenRoad is mostly pressed sandwiches. The one I picked is called The Tuscan. 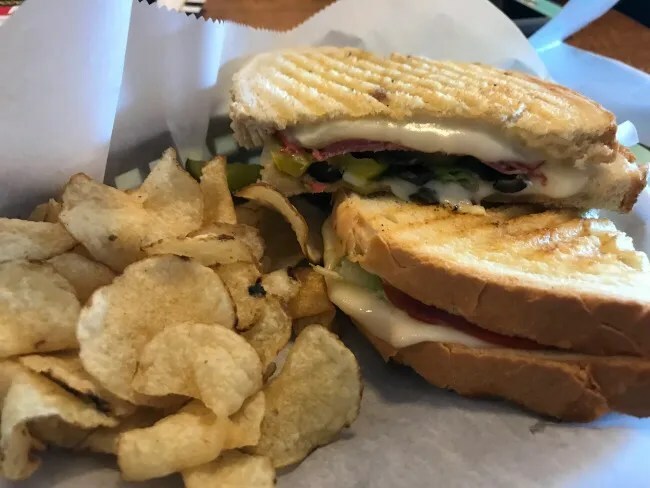 The sandwich is Provolone cheese, capicola, salami, banana peppers, black olives, lettuce, and a creamy Parmesan IPA dressing. These sandwiches are very simple but very delicious. My favorite part was the sauce which just kind of hung out in the background. The sandwich wasn’t dripping with dressing. It was there adding flavor without being seen. The combination of the sweet, tangy banana peppers with this kind of sauce is one of the guilty pleasures. The sandwich comes with kettle chips which I shared with L since she didn’t get any. J’s sandwich was similar to mine. She picked The Destination. 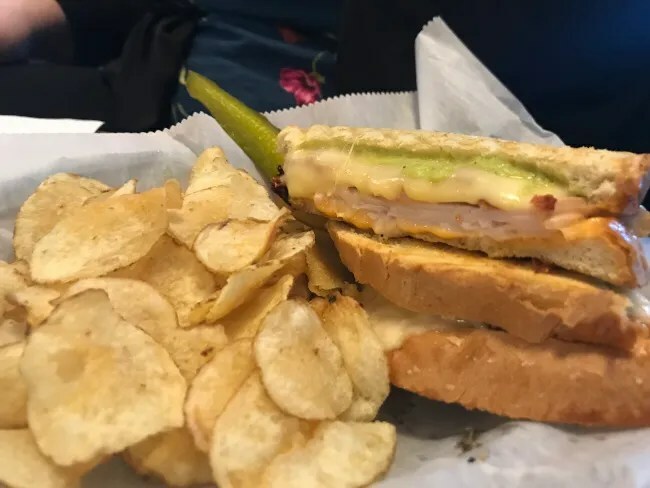 This sandwich is turkey, Havarti, bacon, tomato, guacamole, and a sweet and spicy mayo. She was on the fence when it came to choosing this because she is hit or miss with turkey but she wanted the avocado and just went for it. The turkey was “hit” and she really enjoyed the sandwich. There is a small kids menu but L chose not to pick off it. She picked a cheese quesadilla instead. 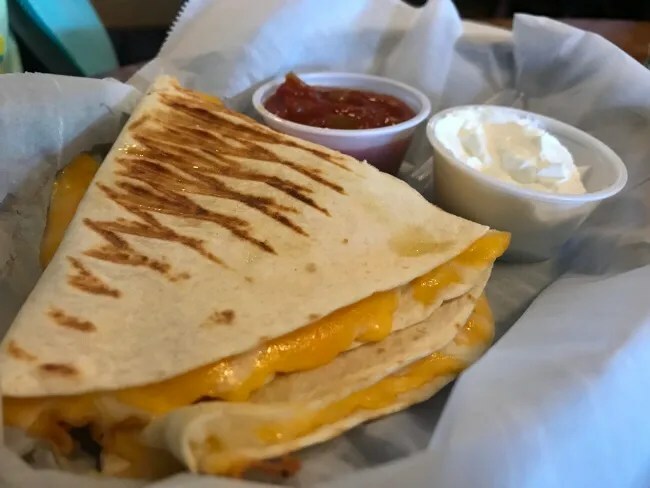 This is pretty much what it sounds like….a large flour tortilla filled with cheese. The cheese was oozing out of all sides of the tortilla. It came with sour cream and salsa but she didn’t use either. B picked his meal off the kids menu. The choice was between dinosaur chicken and grilled cheese. He picked the grilled cheese. The sandwich is on the same bread as J and I got with our sandwiches but his was only a half. 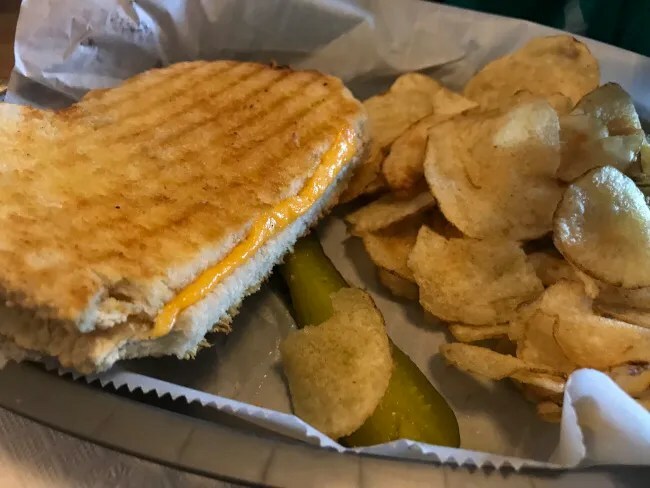 The bread was filled with cheese and pressed on the panini press to give it a nice crunch. Our meal came out about $55 before tip. 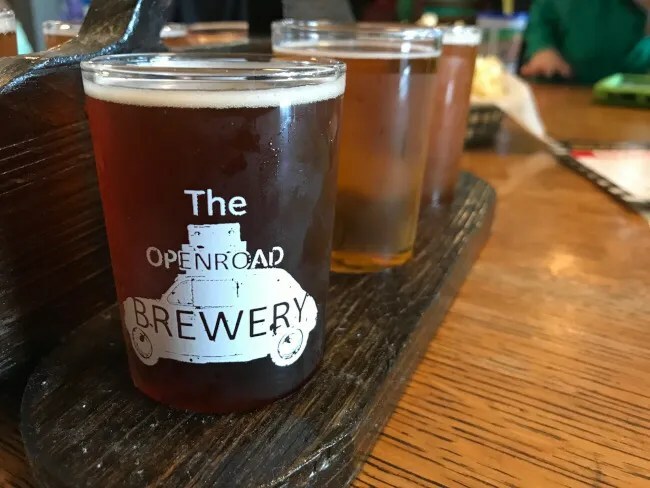 OpenRoad Brewery is another one of those great small town, neighborhood breweries. The place was packed on Saturday night and it had the feeling of most of the people in there knew each other. 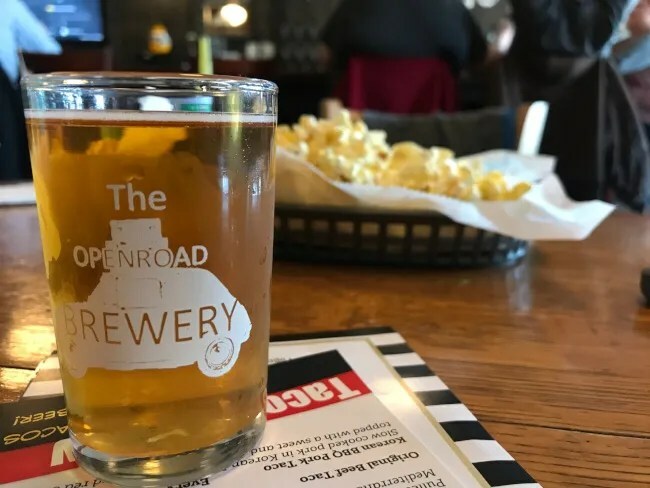 They combine great beer with delicious food in a great setting just a few miles from the US-131 exit. Most people don’t get past the McDonalds when they get off the highway but they don’t know what they’re missing if they’d just keep going in to town. Thank you so much for the great review. We hope you can make it in again soon. Cheers!